I got this sticker today. I was given it. I’m not sure I ever imagined having one. I’m not sure what to do with it. And then I realized what I was going to do with it. I was going to make it my profile picture. I was going to put it up in my office. I was going to post it right here on my blog. I was going to be willing to stand up and say it: I love Planned Parenthood. I don’t love why Planned Parenthood exists. I don’t love that too many states allow legislators to restrict women’s health. I don’t love that we don’t do reproductive education well (or at all, or even worse that we do with mistruths). I don’t love the circumstances that find people needing the services of Planned Parenthood. I don’t even like all that Planned Parenthood has to do. I don’t… well enough of that. I could go on for a while and let’s not make this about what I don’t like. What I love is the dedicated staff of people who are doing the ministry of caring for people. Fighting for people. Fighting for life. That’s right: fighting for life. I walked out of a meeting this morning at a Planned Parenthood office/clinic and saw a lone protestor holding a sign that said, “They kill babies here.” I have a lot of thoughts about that sign but I will restrain myself. Here is what I thought that is most relevant: This is resurrection work. No, not the sign carrier. The people I love at Planned Parenthood. They are resurrection workers. On Easter Sunday I preached to my congregation, as you would expect a Christian pastor to be doing, about resurrection. The challenge I felt and shared this year was about filling places of death with life. The tomb the women in Mark’s Gospel encounter is not empty. It is full. It is full of mystery and wonder and messenger who tells them that Jesus has be raised from the dead. That Jesus would meet them – as he promised – and that they needed to go and tell, see and share, participate in resurrection life. The challenge I felt and share with my congregation was that we needed to be people who rolled back the insurmountable stones that trapped people in death. That we need to fill places of death with good news. That we need to “raise people up” even as we are raised up. And then today it hit me: when I saw that message of death, that what these dedicated people were doing for the lives of those who come to them was EXACTLY that. They were rolling back stones too large to move. They were working hard to remove shame and barriers and replace them with care and nurture. They were promoting life in a place all too often named a tomb. They were resurrection workers. Though they wouldn’t call themselves such. They are just doing what they feel every human being should do. Help those who don’t know where to turn, and present options (all too often impossibly challenging ones) to people who were shut down and shamed at the other doors available. Why do we make it so hard for people to care for people? I heart Planned Parenthood. I love these people who do not care what others will label them or say about them or even say to them. They care too much about people and too much about life to let hate and ignorance hold them back. As a Christian I am called to grace, forgiveness, mercy… and building up of those who life has torn down. And from all I learned today, some of the greatest practitioners of that are the people working at Planned Parenthood. 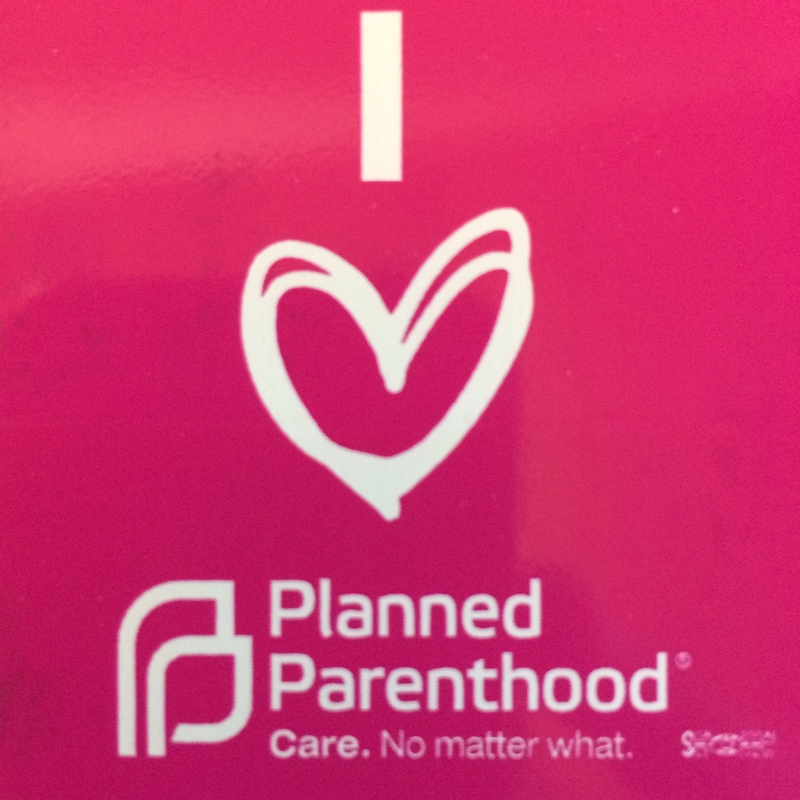 So I say it proudly: I love Planned Parenthood. I love the people that are Planned Parenthood. I love their ministry. I love that they live resurrection in a way I only talk about it. “Care. No matter what.” Those are words to LIVE by! Shortly I will leave my office to once again attend the Idaho Day of Holocaust Remembrance. While I find this moving each year to hear the stories of what we once allowed to transpire. The true purpose and importance of such an event is not rooted in the past. It is rooted in the present moment. It is rooted in the act of re-membering. When we hear the stories of oppression, violence, and other-ing of our neighbor to some less than human, less than protected, status – we are reminded of our need to intentionally allow, draw back in, and empower these people into membership with our common human unity, our humanity. We are reminded that it is our responsibility to ensure a society that doesn’t deny the full humanity of any neighbor, that protects the minority, and seeks with strong purpose to include those who are all too easily ignored and neglected. We are reminded that remembering isn’t a passive act nor an intellectual one. It is an active intention to be about the process of including, building up, and promoting the full inclusion of people in our commonwealth. Remembering claims us for the work of seeking the welfare of all people. So this day I will hear stories of victims of past ignorance, past hate, and past avoidance. But I will be re-membered in to the work of attending to the way we still promote such hate, such ignorance, such avoidance in our own lives and to our own present neighbors. And I will re-commit to ensuring: NEVER AGAIN! Hold me accountable to the task, my friends, and join me in the work of remembering and re-membering – this day and all days. That it was raining on what will likely be our last vigil for the 2015 legislative session (don’t worry we will be back in 2016, we are not going away) was very fitting. 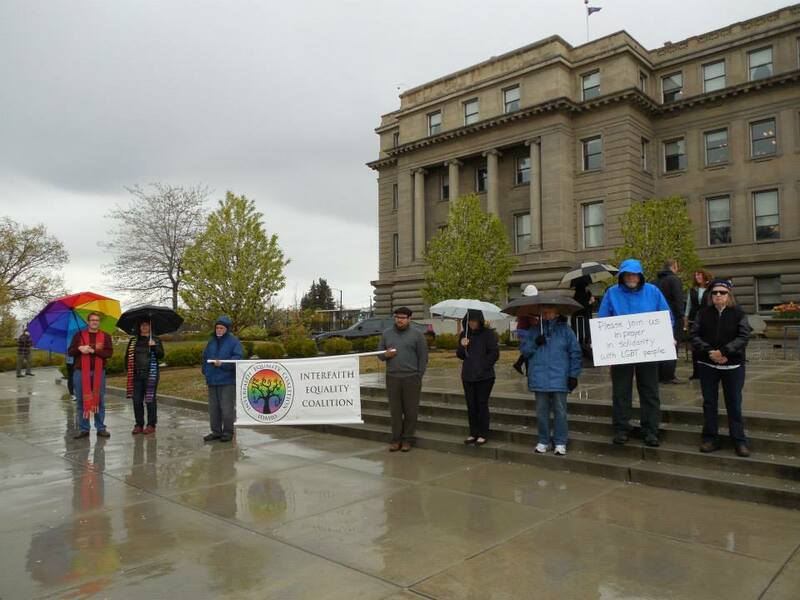 Prayer vigil to #addthewords on the steps of the Idaho State Capitol with the Interfaith Equality Coalition on April 8, 2015. It speaks to our spirits. Our hope was dampened by another season without adding the words. That this final vigil was displaced by another rally and rained on seemed to symbolize the way the add the words movement is treated (though I mean no negativity towards the other rally this day that was also for a great cause… its just… the way of things…) The movement to get equal rights for LGBT neighbors is always having to make way and move to the side. It has been a long, long rain. One that many were not able to endure. Too many tears have fallen, too much blood has split, too many people scattered to the wind to find safer skies. And yet many faithful hardworking people keep working – more each year – to add the words because we trust that this will end in a rainbow. It will end in justice. It will end with adding the words and love winning the day. Lastly I think about the fact that rain is necessary to bring forth life. It may ruin a day or a plan or make it cold and wet. But we need it, the water it provides is the life blood of our world. And while the words were not added this session there were drops of life all around. A hearing for the first time. Stories shared and told and heard, yes and even tears shed for those who still can’t quite open their heads to be the agents of change we so desperately need in our state leadership. Waters of justice fall down, and though we do not yet see the springing forth of a new day… all that testimony is making a difference. So rain down on me, rain down on us all… the change that we are working for will come – you might as well try to hold back the tides. We will see you out on the steps again next year, and the year after, and the year after: rain or shine. I have always know the meaning of ambidextrous. It means that you can use both hands with equal skill. But I recently had an ophthalmologist tell me that they used the names dexter and sinister to talk about the right and left eye. Dexter means right. Sinister is left. (Both come from Latin roots.) When we talk about handedness and say someone is ambidextrous we are as much saying you have two right hands, that is two good hands, rather than simply two dominant hands equally capable. Because we all know, that the right hand is good… and the left is evil. It is: sinister. The Anglo-Saxon lyft means weak or broken, and even modern dictionaries include such meanings for left as “defective,” “crippled,” “awkward,” “clumsy,” “inept,” and “maladroit,” the latter one borrowed from French, translated literally as “bad right.” Most definitions of left reduce to an image of doubtful sincerity and clumsiness, and the Latin word for left, sinister, is a well-known beauty. This is hardly new information, of course. You have all heard it before. But it just made me aware once more how much we seek to homogenize the world. We seek to make everyone look the same. We can relate to people in so far as they look, feel, and value the same as we do. And on the other hand (pardon that pun) we fear that which is different – at best as something we cannot relate to and at worst as an evil to be stamped out. To this end, the dominant norm will try to make the minority among us adhere to our values, our aesthetic, and our way of being. So we’ll force left-handed kids to learn to be right-handed, if not outright (as once was the case) then by neglecting to adjust our teaching to help them. I have a left-handed son. This is still a thing. He had horrible hand-writing until one day we got his grandfather to sit down with him and show him how to write left-handed. One day! That was all it took. Suddenly he had neater writing than I ever have. I wondered then and I wonder now, why didn’t the school have older kids come down to the younger classes to work with left-handed students? How easy is that? Maybe your school does – bravo if that’s true. But the point, of course, isn’t about being left-handed. The point is that there was a time we co-opted language, and even scripture, to make a case about how bad it was to be left-handed. We probably even claimed it was scripture’s actual intent (we are really good at fooling ourselves in such ways). We used scripture to make a theological claim on behalf of mistreatment of left-handed people. Ten percent (slightly more actually) of our society made to feel wrong about not being right. The deeper point, of course, is that we are doing this all the time – often without knowing it. We do it with the words we speak, the laws we pass and don’t pass, jokes we tell that reinforce hurtful stereotypes (even if we try to say we don’t mean it but just think it’s funny), and yes – even the way we set the table and arrange the guest list. We look with scorn on people who don’t speak our language. We assign girl toys and boy colors. We refuse to do the work of learning other cultural world-views on the belief that ours is superior. We aren’t just right-handed: we are right-cultured. It would just be better for you to learn to be that way too because it will go a lot better for you (and it SURELY is a lot easier on us if we don’t have to compromise our comfortable ways). Jesus who sat and ate with those on the margins. Jesus who let a prostitute (or sinful woman of the city) wash his feet. And that Luke reference is important because Luke makes it clear, “the Son of Man has come eating and drinking, and you say, ‘Look, a glutton and a drunkard, a friend of tax collectors and sinners!’ (Luke 7:34) This doesn’t say that Jesus confronts sinners, that Jesus saves sinners, that Jesus love sinners but hates their sin. This says Jesus is a friend of sinners! Damn him doesn’t he know any better? Doesn’t he know that hanging out with the wrong people gets you labeled? And then it hits me. Jesus is left-handed. Gotta be. Jesus loves with a sinister love, and Jesus loves the sinister. Jesus seek out those on the margins, that ten percent, those that couldn’t fit in the mold of the dominant norms. Those who were wrong because they weren’t right. These are the ones Jesus calls friend. If we are those who intend to walk in the way of Jesus. Those who are called to follow and take up his mantel (a cross I hear… how sinister is that?) and take up his name and live his truth in the world than we need to be those who are willing to out ourselves. We need to name our homogenizing sinfulness. Our sin of righting the world, our sin of claiming right-ness… righteousness. And we need to be a lot more sinister. It is time, way past time to break our molds. It is time, way past time, to set aside fear and power and learn from one another about different ways of being, of seeing, and of valuing. It is time, way past time. So let us set aside being right, let us lift up those who have been wronged, and befriend those who discomfort our known (and relatable) world in order that our world might grow larger through sinister love. It is the way of Jesus. It is the way of love. It is the way of the God who is love.